Carson was diagnosed with cerebral palsy when he was 8 months old. 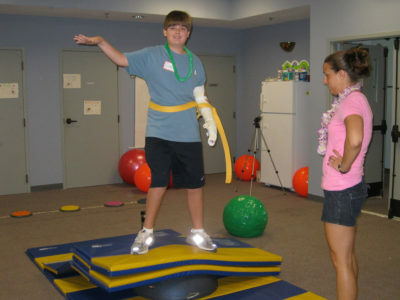 We spent years in physical & occupational therapy which benefited Carson greatly and kept him “on track”. However, about 5th grade the demands of school and Carson’s own interest made weekly therapy visits seem impossible. The pre-teen growth spurt hit and before we knew it Carson had regressed tremendously in his ability to use his right hand and his limp had become more severe. When we went for his annual visit with his neurologist in May (at the end of his 7th grade year) and she was extremely concerned about his regression. She recommended Powerhouse Therapy’s Constraint Induced Therapy program for Carson. With a limited amount of time to make a decision, I contacted Charlene and she was wonderful in explaining what her program had to offer. However, I remained concerned about Carson being the oldest attending the group session and the age difference between him and the others. It was also a big financial and time commitment since it would be necessary for us to stay in Roswell for those 3 weeks. With many mixed emotions, but with the reality of only a short window remaining to help Carson we signed up. It was one of the best decisions we have ever made! The staff was great and the program was challenging. There was even a point during the 3 weeks when he wanted to quit. I think the program is harder in some ways for a 13 year old than for the younger children due to all of the emotional issues they are dealing with as well as their physical issues. Carson had to answer the question, “is this as good as it gets and am I willing to settle for where I am now?” These were tough questions for a 13 year old but he choose to stay and the confidence and determination he gained during those 3 weeks continues with him today. He came home after completing the CIMT program actively engaging his right hand and committed to a new strength training program. As Charlene, put it to Carson and me…this isn’t a choice. The Powerhouse Therapy program also showed us it was time for Carson to begin taking responsibility for managing his CP. Today he is in great physical shape (because he has stayed committed to strength training) and his limp is under control. He also continues to push himself to engage his right hand. Also, my concerns about the age difference were unfounded. Charlene and the staff did a great job tailoring the program to fit different age groups. Even better the older and younger children loved being with and helping one another. Carson still talks about some of the younger children he got to know. It has been 2 summers since Carson attended Powerhouse Therapy and he has come a long way! He is completing his Freshman year of high school with high honors, he is enrolled in a driver rehabilitation program at CHOA, and he is on target to have his drivers license in August! The Powerhouse CIMT program even prepared Carson for driving. Each child is evaluated before being accepted into the driver program to determine if they need additional therapy before beginning the program. Several of the tasks he was asked to complete would have been impossible had he not attended the CIMT program and would have delayed him driving. As a parent, I would recommend the CIMT to you and your child. We went for “physical help” and came away with that and so much more!